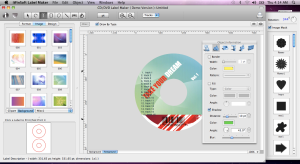 Everything you need to create a professional, stunning label for a CD or DVD is in the powerful iWinSoft Mac CD/DVD Label Maker (compatible with Mac OS X 10.5 or higher). 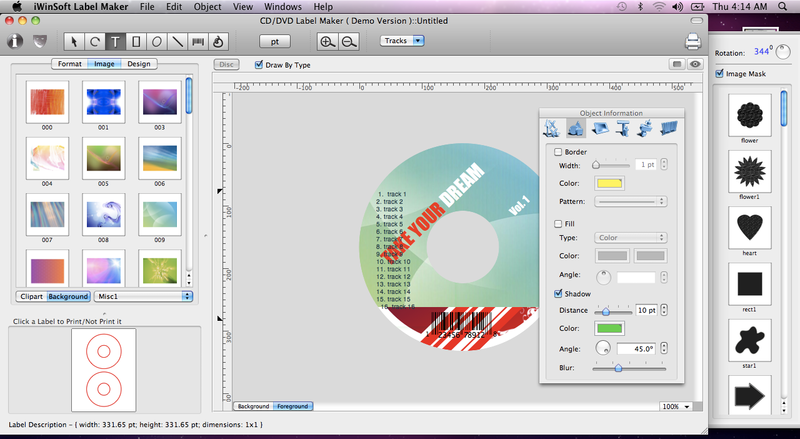 In addition to making great-looking labels, the software can be used to create covers, case inserts, booklets, and jewel cases in three simple steps. It’s perfect to use for a business, at home, or even for a hobby. User-friendly settings allow you to easily create your own design from scratch, or you can use pre-designed templates to generate a label in under three minutes. In a matter of seconds, you can import playlists from iTunes, Text File, etc. Use your own graphics and/or employ amazing layouts, background images and clip-art pictures from the grand art gallery to simplify the creation process. Other settings allow you to add logos, generate barcodes and edit multiline text in a circular format. To make more advanced label designs, you can organize your design using separate layers. A background and foreground layer helps you to easily organize the different elements of your creation. The Bezier tool enables you to create vibrant and unique shapes for your photos and images. You can even insert a table to the label. A text tool box allows you to insert text or edit existing text. To add your own graphics and images, simply use the import clip-art option located under the file menu. The built-in Image Editor gives labels a professional and precise quality through numerous image effects like tints, opacity control levels and image filters. It supports bleed printing and color gradients, works with numerous disc sizes and paper types, and is compatible with Epson printers. The iWinSoft CD/DVD Label Maker software has a printing calibration and alignment feature that works great with any laser or inkjet printer on a vast array of paper types. Labels can be printed two to a single sheet. The Universal Application allows this software to be run on PPC Mac and Intel Mac, and it is compatible with Snow Leopard and Lion. Labels can be saved as a PDF, TIFF or a PS file, or they can be exported as a JPEG, BMP, PNG, , PDF or TIFF file. It also supports various RAW image formats from cameras. iWinSoft CD/DVD Label software is the excellent choice for an individual or a business that desires professional results using user-friendly software. At a discounted price of $29.95, it is the lowest price guaranteed; if you find cheaper labeling software, the difference will be refunded. Online ordering is completely secure and if multiple copies are ordered, customers receive them at a discounted price. When you order online, you instantly receive a key and code via email.